For the March Daring bakers’ challenge, Korena from Korena in the Kitchen taught us that some treats are best enjoyed upside down. She challenged us to make a tarte tatin from scratch. I had so much fun it seems like I took a million pictures. This is one of those recipes that I want to make again and again and try different fillings because I bet almost all of them would be amazing. I will say that I got so excited that I forgot to peel the apples which the recipe called for, but it's delicious anyway and didn't take away from the dessert. I wish I had fresh whipped cream to go with it, or vanilla bean ice cream but even by itself it was so good. 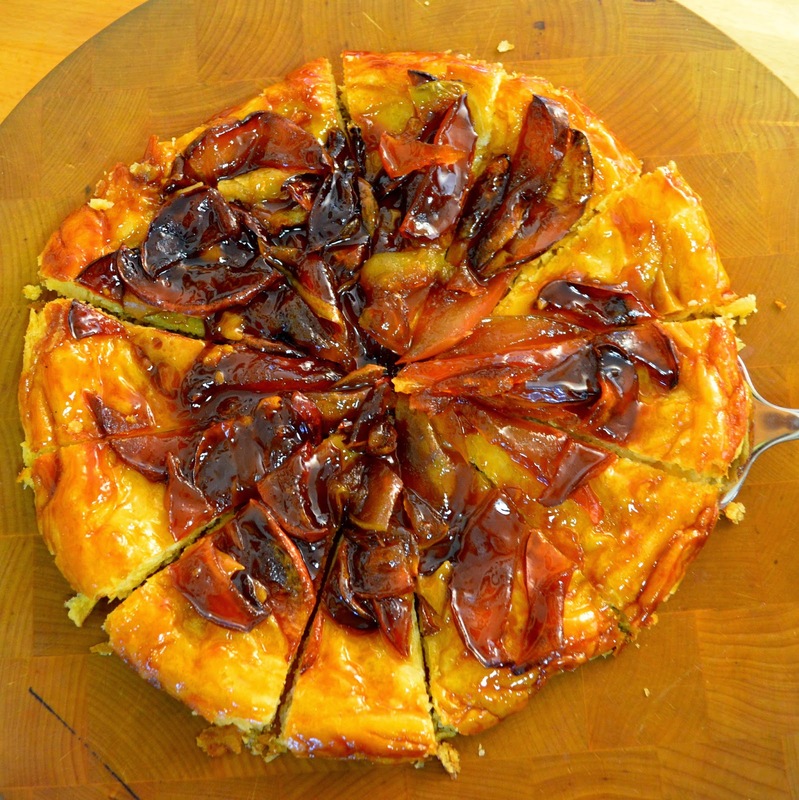 My caramel was a bit chewy but I liked the way it combined with the soft apples and the crunchy "crust". The recipe may seem long but it goes quick and it's not hard, it just takes a little time. 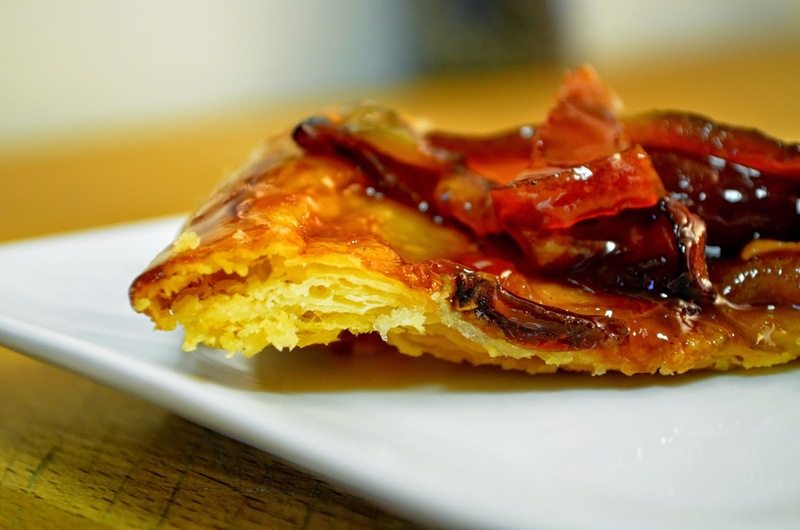 Make the pastry first, then while it chills, prepare the apples and caramel for the filling. By the time you are ready to cover the filling with pastry, it will be chilled enough to roll out. Turn the dough out onto your work surface – don’t worry if there are still pockets of dry flour. Gently knead and squeeze the mixture a few times just enough to bring it together into a square (a bench scraper is helpful for this). Be careful not to overwork the dough: there should be visible bits of butter and it should still look very rough. 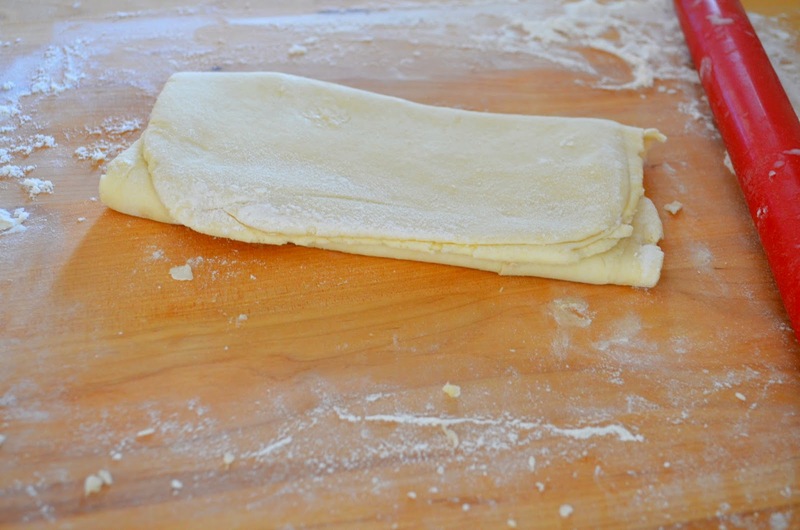 Lightly flour your work surface and rolling pin, and roll the dough out into a rectangle about 10” (25 cm) long. Fold the bottom third of the dough up into the middle, and fold the top third down, like you are folding a letter. This is one fold. Turn the dough a one quarter turn so that one of the open edges is facing you, and roll out again into a 10” (25 cm) rectangle. Fold again - this is the second fold. Repeat the rolling and folding 3 more times, for 5 folds total. Your dough will get smoother and neater looking with each fold (the pictures show the first and fifth folds). Peel the apples and cut them into quarters. Remove the cores in such a way that each apple quarter has a flat inner side: when placed rounded-side-up, it should sit on a flat base. Place the apples in a large bowl and toss with the lemon juice and 1/3 cup (80 ml) (2-1/2 oz) (65 gm) sugar. This will help draw out some of the moisture from the apples and prevent an overly runny caramel. Set aside for 15 minutes. Preheat the oven to moderately hot 375˚F/190°C/gas mark 5. 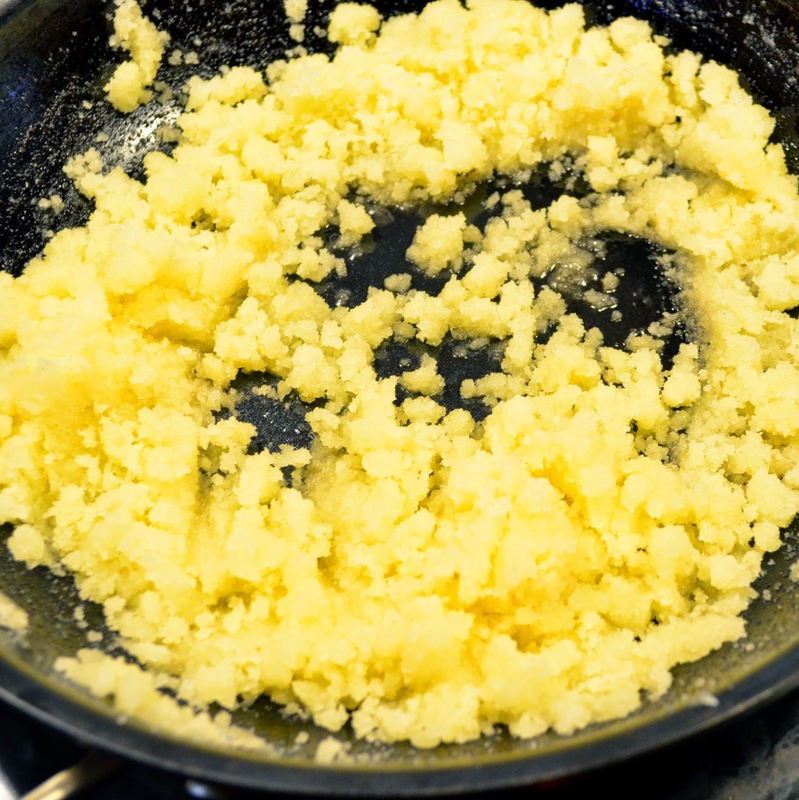 Melt the butter in a very heavy, 9” or 10” (23 cm or 24 cm) oven-proof saucepan over medium heat, then sprinkle with the remaining 1 cup (240 ml) (7 oz) (200 gm) sugar. Stir with a whisk until the sugar melts and becomes a pale, smooth caramel. 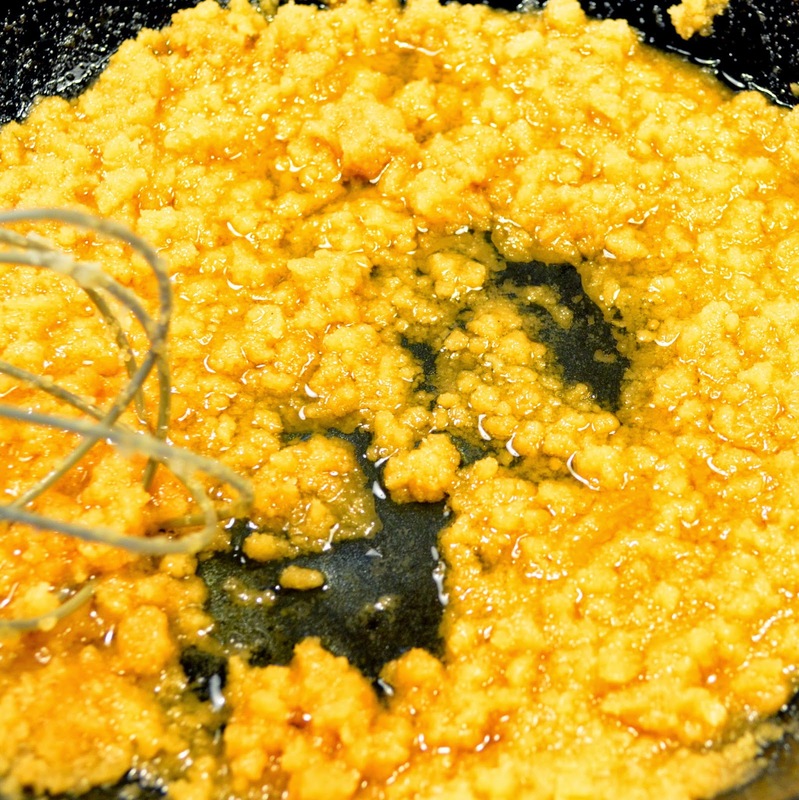 The sugar will seem dry and chunky at first, then will start to melt and smooth out. 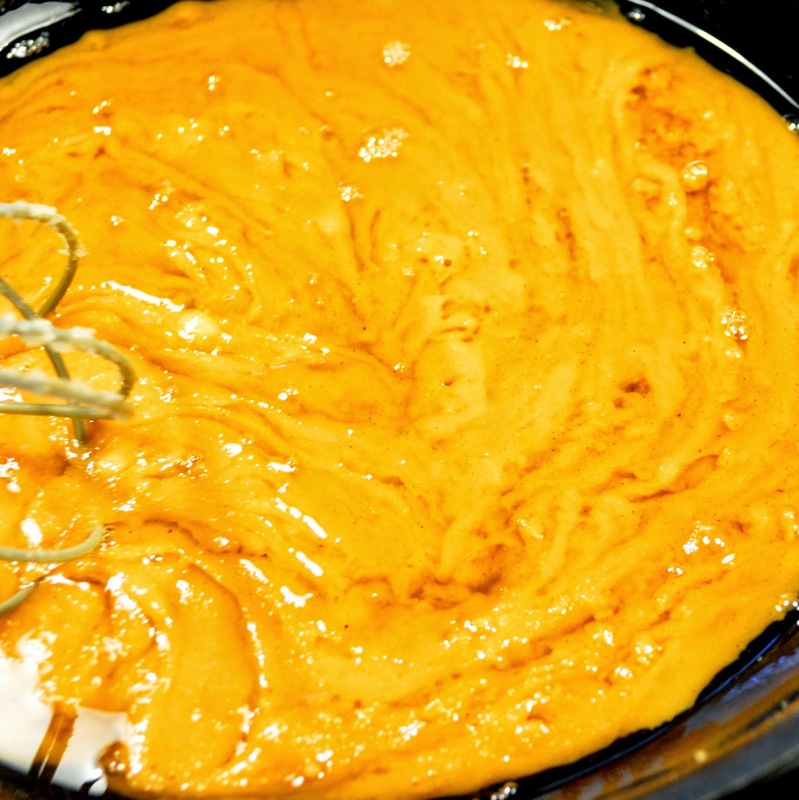 If the butter appears to separate out from the caramel, just keep whisking until it is a cohesive sauce. 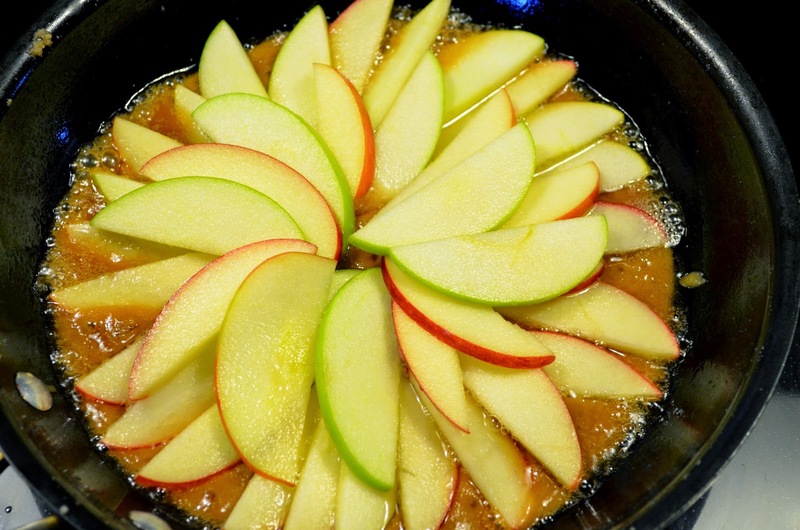 Discard the liquid that has come out of the apples, then add the apple quarters to the caramel, round side down. They won’t all fit in a single layer at first, but as they cook they will shrink a bit. Cook over medium heat for 15-20 minutes, pressing down gently on the apples with a spoon to cover them in the caramel liquid. 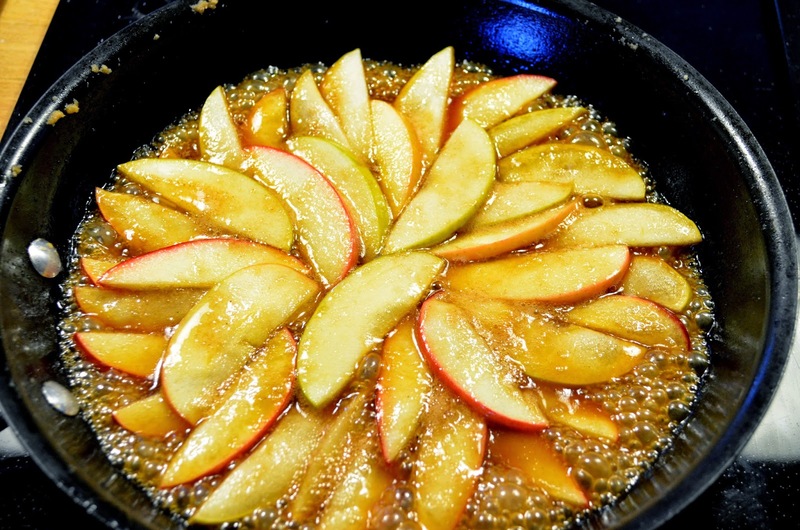 Move the apples around the pan gently so that they all cook evenly, trying to keep them round side down. When the apples have shrunk enough to mostly fit in a single layer and are starting to soften but still keep their shape, remove the pan from the heat. 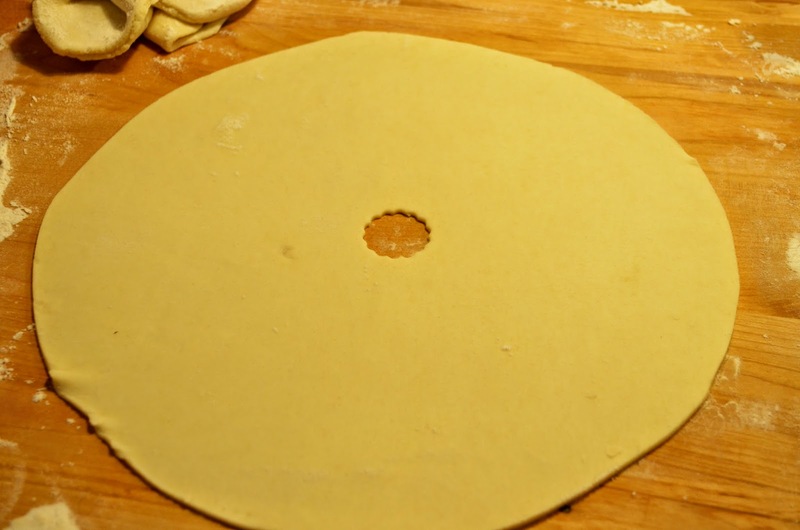 Remove the pastry from the fridge, roll it out on a lightly floured surface, and trim it into a circle about 1” (25 mm) in diameter larger than your saucepan. Lay it over the filling, tucking in the edges between the apples and the sides of the pan, and cut a few steam vents in the pastry. 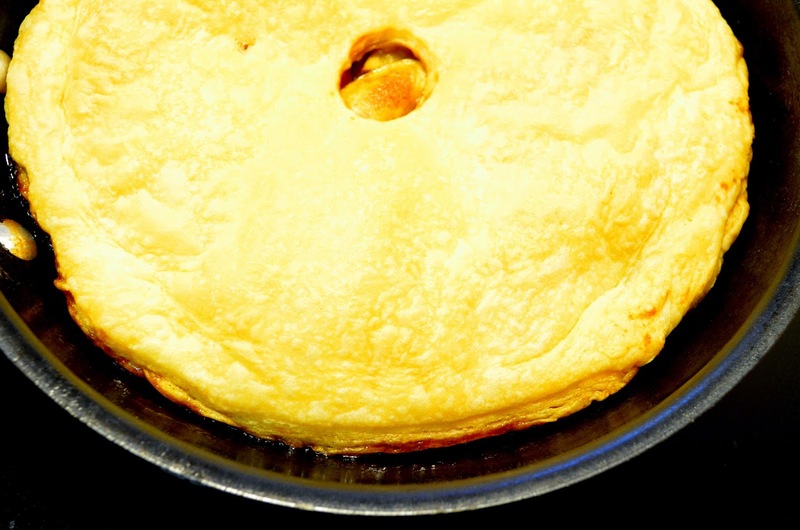 Place the saucepan on a rimmed baking sheet (just in case the filling decides to bubble over the sides) and place in the preheated moderately hot 375˚F/190°C/gas mark 5 oven. Bake for 30-35 minutes, until the pastry is puffed and golden brown, increasing the oven temperature to moderately hot 400˚F/200°C/gas mark 6 during the last 5 – 10 minutes of baking if the pastry isn’t browning properly. 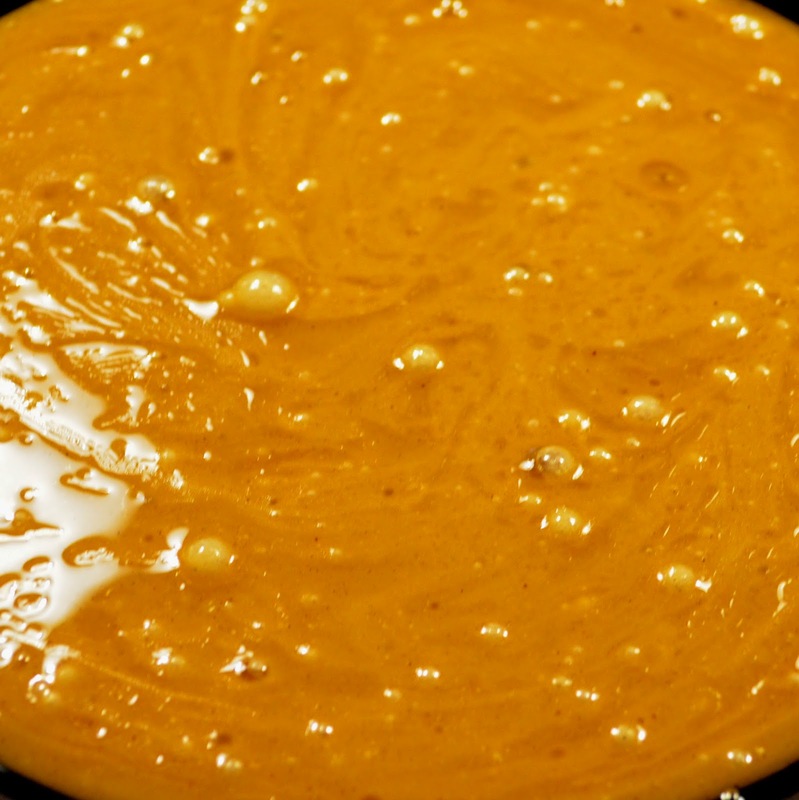 Remove from the oven and let sit just until the caramel stops bubbling. 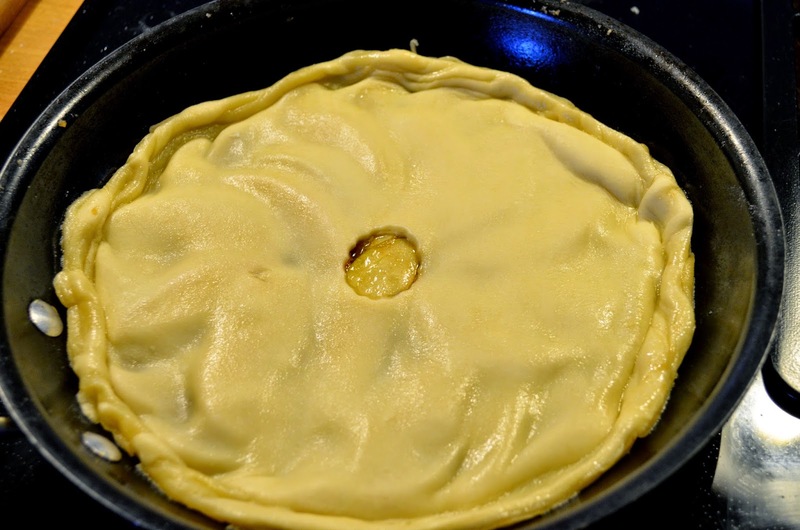 Immediately place a serving platter (slightly larger in diameter than the saucepan) over the pastry. Wearing oven mitts, grab hold of the saucepan and platter and quickly invert everything to unmold the Tatin onto the platter. If any of the apples stick to the pan or come out of place, rearrange them with a spatula. 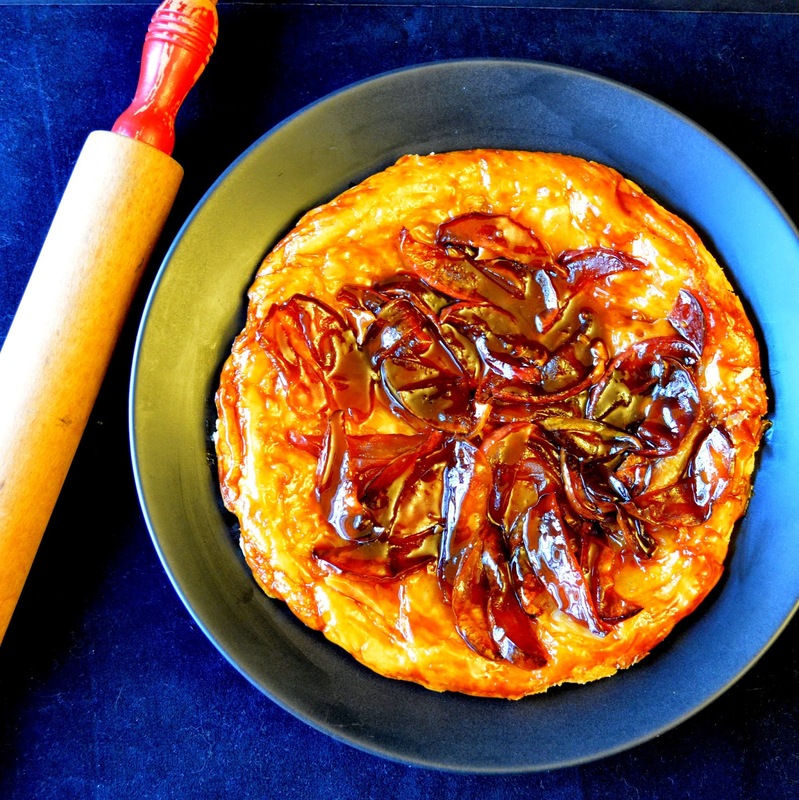 The tarte Tatin can be served warm from the oven or at room temperature. Suggested accompaniments include vanilla ice cream, whipped cream, or crème fraîche.